This interview took place on: 4/30/10. Jesus freak Hideout (Logan Leasure): How did you guys get started? 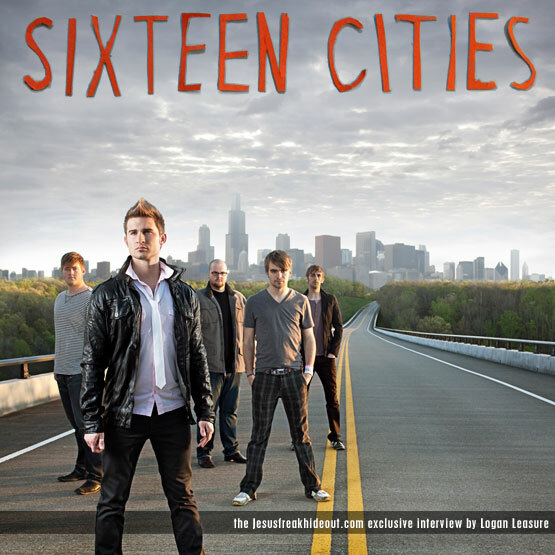 And why the name 'Sixteen Cities'? Josiah Warneking: The band first came together in high school. We all went to one the largest public schools in Oregon and felt an urgent need to start some kind of ministry to reach our campus. So every Wednesday morning we'd get together and lead worship and pray with our peers. We had no idea what we were doing; we simply knew that students at our school needed to know the love of Jesus. After our first year of meeting every Wednesday morning, over 100 students were coming regularly. Not long after that, we spread the ministry to nine other high school campuses in the Portland area and began doing rallies to unite all the students from different schools in one place. It felt like God was starting a movement in our city and without ever planning on becoming a band, we were finding ourselves involved in a full-time music ministry. After graduating high school, we knew that God wasn't finished with us yet. We prayed all Summer long and felt God calling us to continue our ministry to young people through music. And the best way we could do that was to start a band. When choosing our band name, we wanted to make sure our vision was incorporated into our name. We've always wanted to be a "relevant voice for our generation, pointing them to a real God." So when we heard about the tribe of Issachar in the Old Testament, who were the "men who understood the times and the seasons and knew God's heart for Israel," we wanted our name to be related to this relevant tribe. After searching through Scripture, we found a verse in Joshua 19:22-23 that said, "the inheritance of Issachar were sixteen cities." And for some reason it seemed like the perfect name for our band. JFH (Logan): To someone who is unfamiliar with your music, how would you describe it? How would you classify your genre? Josiah: I think our music could be described as contemporary pop rock, with catchy melodies and meaningful lyrics. Many of our songs are piano-based with soaring guitars and intricate vocal harmonies. We always try to combine creativity with purpose, hoping to create songs that speak directly to the hearts of our listeners. Even though we love epic choruses and artistic musicianship, our number one goal is connecting people with God through our music. JFH (Logan): Who have been some of your biggest musical influences and why? Josiah: Our musical influences are about as unique and different as the members of the band. We all grew up in the church, so worship music has been a large factor in our "sound." Some of us grew up listening to Christian music like Jars of Clay, Audio Adrenaline, and dc talk, while others were raised on The Beatles and Coldplay. Personally, I think my biggest musical influence was my mom who was the worship leader at our church. I remember hearing her play songs on the piano in the living room every night, and that's how I learned to truly worship God. JFH (Logan): Did you have a general theme for this album? Where did you draw your influence from when you were writing for it? Josiah: When I was writing for this album, I wanted each song to deal with a different aspect of our relationship with a real, living God. Sometimes we're celebrating His greatness, while other times we're lamenting how far away we feel. I didn't want to write in words I wouldn't use when talking to my best friend. I wanted our songs to be honest and real, above all else drawing us closer to the heart of God. So I'm not sure if there's a theme or not, but I hope anyone listening to our record would see themselves like God sees them and understand His love a little more. JFH (Logan): Do you have a favorite song and/or one that means most to you out of the bunch? Josiah: Each song on this album has a special place in my heart. Depending on the day, any one of our songs can speak into my life in a powerful way. However, if I had to pick one song that continually gives me chills it would be, "Pray You Through." Every time we hear testimonies of how this song helped a young person or a family through a difficult situation it becomes that much more meaningful to me. We had the opportunity to play this song for a little boy named Caleb who was battling a rare form of bone cancer. Little did we know, it would be Caleb's first and last concert. Weeks later, we heard that "Pray You Through" not only helped the family in their time of mourning, but was the song played at Caleb's memorial service. Now their family is all I can think of when we play the song at our shows. JFH (Logan): The first time I ever heard one of your songs ("Sing Along"), it was playing in Hollister. Given the secular atmosphere of store like that, do you ever plan on making any sort of crossover into the mainstream? Josiah: We were honestly amazed that our song, especially one that speaks so directly of God, would be added to the Hollister playlist. Thousands of young people flooded our Myspace and Facebook after hearing "Sing Along" and people who had never before listened to Christian music became fans of Sixteen Cities. We were thrilled! We definitely pray that God would use our music to reach anyone who needs to hear it. We love the church tremendously, but are not afraid of where God might send us. We love that light shines so much brighter in darkness and if mainstream clothing retail stores remain an outlet for our ministry, then we'll embrace it whole-heartedly. However, we're unwilling to hide or mask our love and devotion to Jesus Christ. We'll simply go wherever He sends us. JFH (Logan): Any other projects in the works right now? Any music videos? Josiah: We're currently writing songs for a worship album, which will hopefully be released in the late Fall. Leading worship is such a huge part of our ministry and we wanted there to be a recorded representation of that piece of Sixteen Cities. No music videos yet, unless we decide to make one on the road. You never know what could happen while on tour. JFH (Logan): Is there anyone in the industry you'd really love to work with on future projects? Josiah: We were honored to work with some industry superstars on this album, like Jason Ingram, Rusty Varenkamp, and Steve Wilson. We'd love the opportunity to work with any one of them again. We'd also love the chance to partner with some other artists like Brandon Heath, Mac Powell or Chris Tomlin on a song or two. I love when Christian artists work together on projects. It seems to create a unique kind of unity. JFH (Logan): Are there any obstacles God has helped you as a band overcome recently? Josiah: Being in a Christian band can be an extremely difficult endeavor, especially after doing it full-time for over five years. Most of the obstacles we face are financial, but it seems God is always showing up at just the right moment with some kind of unforeseen way to make it through the month. He has used some amazing people to support our ministry and help us follow after God's call on our lives. JFH (Logan): What has God been teaching you on a personal level lately? Josiah: God has been showing me how important it is to trust Him explicitly regardless of my circumstances. I'm getting married to the girl of my dreams in August and I'm learning to place all my confidence on the Lord. I'm not entirely sure how I'm going to provide for my family or where I'm going to live most days, but I know God is in control. I can work and struggle all I want but if I forget to rely completely on God, I always mess things up. God's showing me to be like David when he said, "In You, O Lord, I have taken refuge…" Psalm 71:1. JFH (Logan): Were there any challenges getting things jumpstarted (ex. Finding a record label, finding the right people/producers to work with)? Josiah: I would be lying if I said that everything has been easy getting started in the music industry. There have been all kinds of challenges and trials over the years. Unlike most bands, we didn't search for a record label. In fact, we weren't entirely convinced we wanted to be signed at all. We simply wanted to do ministry. After talking with several other labels, Centricity Records invited us to a retreat where we could meet all their staff and get to know everyone better. We were amazed to find a group of believers dedicated to the ministry of their artists. It was such a family-oriented label with a true focus on the things that matter. After signing with them, God seemed to open up all the right doors in regards to producers and studios. Overall, we've felt that God has done all the work and we've simply responded to His blessings. We feel blessed to have people around us who are in music for the same reasons we are. JFH (Logan): Any tour plans coming up? Josiah: This year is going to be crazy! We've already been gone for several months this year and are planning on being on tour for most of the year. In June, we'll begin touring through the west coast and the Midwest visiting churches, youth groups and leading worship at multiple summer camps. In fact, we're completely booked until September when we'll be leaving on a nationwide tour with Remedy Drive. When we get home from our Fall tour we'll be packing our bags for our second tour in Denmark this Winter! We'll get to partner with Youth For Christ and perform all over the country in schools and churches. And somewhere in the middle of all that I'm getting married! This is going to be an exciting year! JFH (Logan): Any last comments? Josiah: We love getting to know our fans and don't take it for granted that people listen to our music. It's for that reason we try as hard as we can to be connected through Facebook, Twitter, Myspace, Blogs, etc. We decided a long time ago that we want to be the kind of band that truly serves our fans, so we're always on the web, answering questions and hanging out with people. Anyone reading this article is more than welcome to come and join us! Thanks for reading!